1 Download and install iTunes 7.3 (or later) from http://www.itunes.com. 2 Connect iPhone to a USB 2.0 port on your Mac or PC using the dock and cable that came with iPhone. (Don’t connect iPhone to the USB port on your keyboard—it does not have enough power.) iTunes opens automatically. 3 Follow the onscreen instructions in iTunes to activate iPhone and sync iPhone with your contacts, calendars, email accounts, and bookmarks on your computer. Why would Apple do this? No one talks this way. What are they getting out of this grammatical detail? At lunch a few of us discussed it and the only thing we could come up with is that it anthropomorphizes the iPhone, and that some how makes it more, uh, human or something. I admit, it’s kind of weak. Any other ideas? They refer to iPod the same way. iPhone is its name. So it makes sense not to have an adjective before it. They’ve also done that all along with iPod. 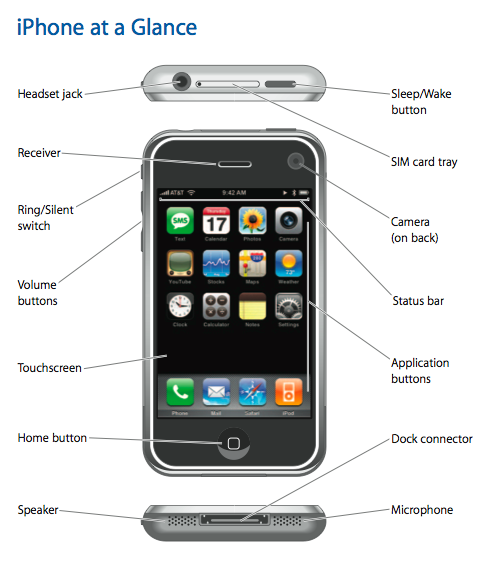 Look at any of the iPod documentation, and the October 2001 keynote where Jobs introduces it. Well who ever said it was THE iPhone? Meaning there will doubtless be more then one model of iPhone eventually, so “iPhone” becomes the family of product with multiple models. Hey there. I’m a blogger who stumbled on your 2006 July 25th post about QTVR. I’m really into QTVR and I want to know how you were able to post yours and link it to your blog. Thanks. Watch the “Guided Tour” video again and you’ll hear that the guy says both “the iPhone” and “iPhone.” Both. I’m < HREF="http://justinblanton.com/2007/06/iphone-personification" REL="nofollow">right there with you<> Dave. See? Dom and Trey didn’t say, “the” Quicktive VR. Ha! Apple do this with all their products. Nothing new. Xserve, Mighty Mouse, Mac Pro, the lot. Anybody remember when “Internet” was popular in media, as opposed to “the internet,” or, as of late, “the internets” or “series of tubes”? I’ve read lots of software manuals that do this with the product name, and I’m sure I’ve seen this in hardware before, as well. This is nothing new. The grammatical structure is odd; ordinary people (not lawyers/marketers) just don’t speak like that. The iPhone, the keyboard, the Apple Cinema Display, etc. “Joe bought <>a<> MacBook and <>an<> iPod.” “I can’t afford <>an<> iPhone.” But people do speak like that about software: “I got MS Word,” not “I got <>the<> MS Word;” “I use Safari,” not “I use <>the<> Safari.” Why the difference? Y’all are silly discussing this. Anyway, referring to it as simply iPhone is grammatically incorrect. The Steve can do what he wants though — it’s his puppy. Yup, they have done the same thing with the iPod, but with the iPhone it creeps me out a little. No doubt its a marketing thing as someone mentioned. You know, the iphone experience vs. just a thing, but still its kind of creepy when you practice that nomenclature !! It gives it a “living” quality of sorts. Its like we’re talking about it as an entity rather than a product. Thus, I refuse to refer to the iPhone as iPhone. I’m not some stupid drone who just mouths along with whatever Apple thinks is the right way to refer to it when I think its creepy. I will get my greedy little hands on one of those thingies as soon as I can :), but refer to it the way Apple marketing wants me to ? F*ck them. Now that IS the true spirit of iPhone, I mean *the* iPhone ! Plus, it’s easy to find-and-replace “the iPhone” with just “iPhone” in Microsoft Word! >Why the difference?One’s a name for a specific instance (your Safari is the same “thing” as the Safari on any other Mac), the other’s a product (or “category”) name, so the specific instance is different (your iPhone is a different “thing” as somebody else’s, but the same category of things). Apple wants to use iPhone more like a human name to make it feel more personal.>referring to it as simply iPhone is grammatically incorrect. No, it’s not. It’s somewhat weird, because it means iPhone is used like an “instance name” instead of like a “category name,” but it’s correct.